Carcharhinus limbatus. Helmut Debelius, http://discoverlife.org. A 2014 report by the International Union for Conservation of Nature (IUCN) stated that over a quarter of all shark and stingray (elasmobranch fishes) species are threatened with extinction, while half have populations low enough to be classified as vulnerable. Therefore, establishing protocols for conservation efforts is a pressing concern. Truly successful management, however, not only means protecting adults, but also requires fostering a healthy juvenile population. Juvenile sharks are known to utilize inshore areas like bays and tidal inlets throughout their early life stages. While it was often presumed these areas were selected based on biotic factors like prey abundance and protection from predators, Christine Ward-Paige and her colleagues at NOAA noticed there were a number of studies contradicting this idea. Therefore, the team decided to turn their attention towards abiotic factors, such as temperature or oxygen levels in the water, that could be influencing habitat preference in sharks—something that had not gotten nearly as much attention. 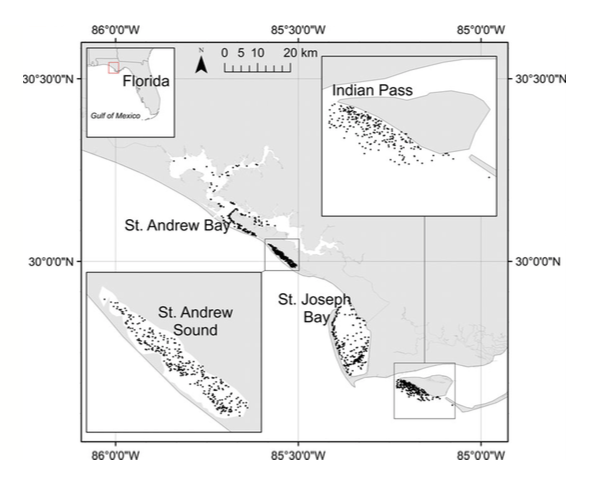 Figure 1: Four locations of gillnet sampling in the northeastern Gulf of Mexico: St. Andrews Bay, St. Andrews Sound, St. Joseph Bay, and Indian Pass. Filled circles denote positions of gillnets. To get an idea of the number and types of sharks in the area, scientists sampled 4 locations in the northeastern Gulf of Mexico between 2000-2010 (Fig. 1). Sharks were caught with gillnets and then identified, categorized as male or female, and measured for size. In total, almost 6,500 juvenile sharks were caught over the decade of sampling. The six most commonly caught shark species (blacktip, bonnethead, finetooth, Atlantic sharpnose, and spinner sharks) were selected from the dataset for further analysis. 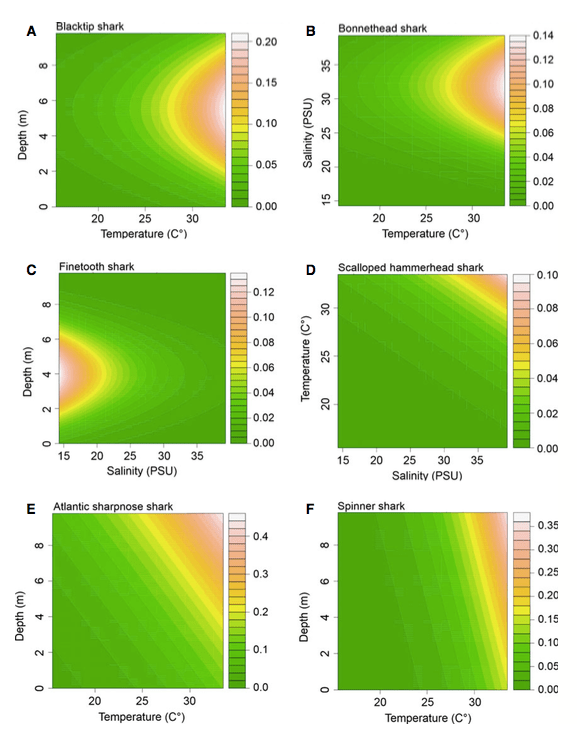 The team screened through abiotic data associated with shark capture information and used mathematical modeling to ascertain the two most important factors impacting each species’ distribution (Fig. 2). The scientists combined their preference model with known environmental conditions for different locations to model where species would be expected in greater numbers (Fig. 3). 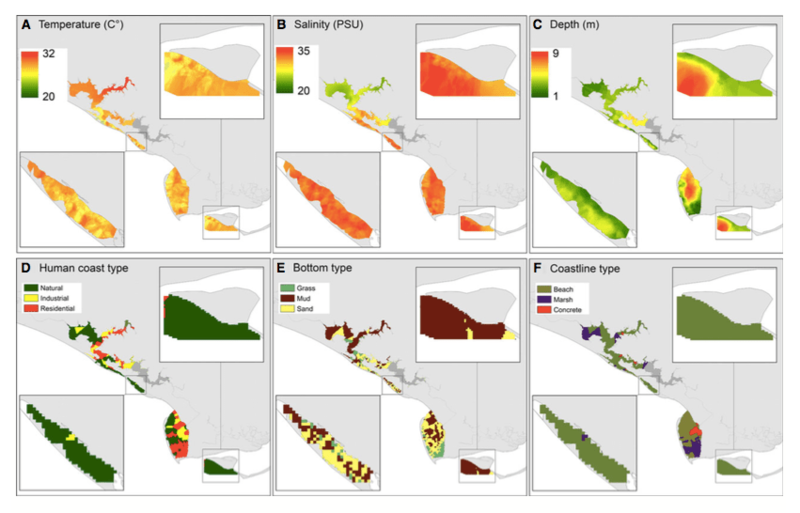 Figure 2: Contour maps showing which two abiotic factors were of greatest influence on habitat preference by species. Temperature, salinity, and depth turned out to be significant for many of the sharks. For example, four of the species showed preference for higher temperatures, but differed in their preferences for salinity or depth ranges. Site location also played an important role, with three of the four sites predicted to host significantly more individuals and species than the 4th site. Since these six species were present in the study region across multiple years, this suggests that even if specific sites are preferred more than others, the region as a whole is important for young sharks. Other abiotic factors, such as human impact on coastlines (development), distances to river inlets, and ocean bottom type (e.g. sand, mud, rock) were not found to play significant roles in distribution patterns of the juveniles of any species. Figure 3: Predicted models of which site should host more individuals of each species based on the preferred abiotic factors and known environmental conditions at each location. Habitat preference studies like this are rare, and those that are conducted often focus on biotic factors. Unfortunately, the interaction of biotic and abiotic factors and their ultimate impact on preference across species is currently unknown. Prey or predator abundance may follow similar distribution patterns, but further study is needed. The value of this study was in its robust contribution to existing data sets on shark life history. First, it provided brand new insights into the habitat preferences of scalloped hammerhead, spinner, and finetooth sharks. 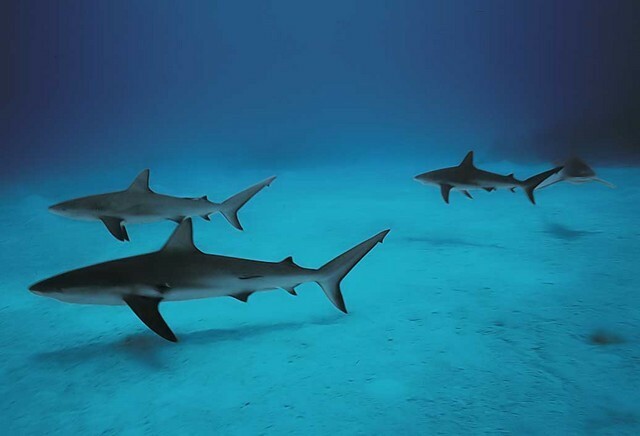 Second, the abiotic preferences noted for the blacktip, Atlantic sharpnose, and bonnethead sharks corroborated known preferences reported in a handful of previous studies. Last, but certainly not least, forecasting preferred locations should aid in focusing conservation efforts, thereby allowing us to more effectively protect threatened shark populations.